The KITTYBUNNYCHICKEN is alive and well! We’ve just been hibernating. There’s been little animal news and our family has been traveling a lot to and from Mississippi to visit my sister Jo, who is still in the hospital but recovering well. 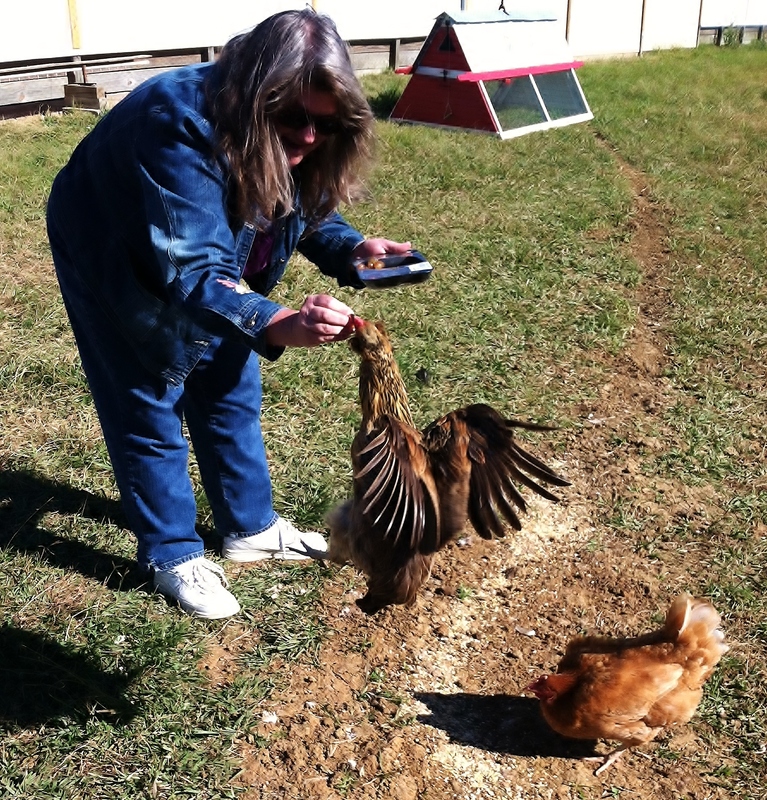 Yesterday, however, Jim and I took a trip to my friend Debbie’s house to pick up our old coop. Debbie doesn’t use it anymore since she has stopped adding babies to her flock. 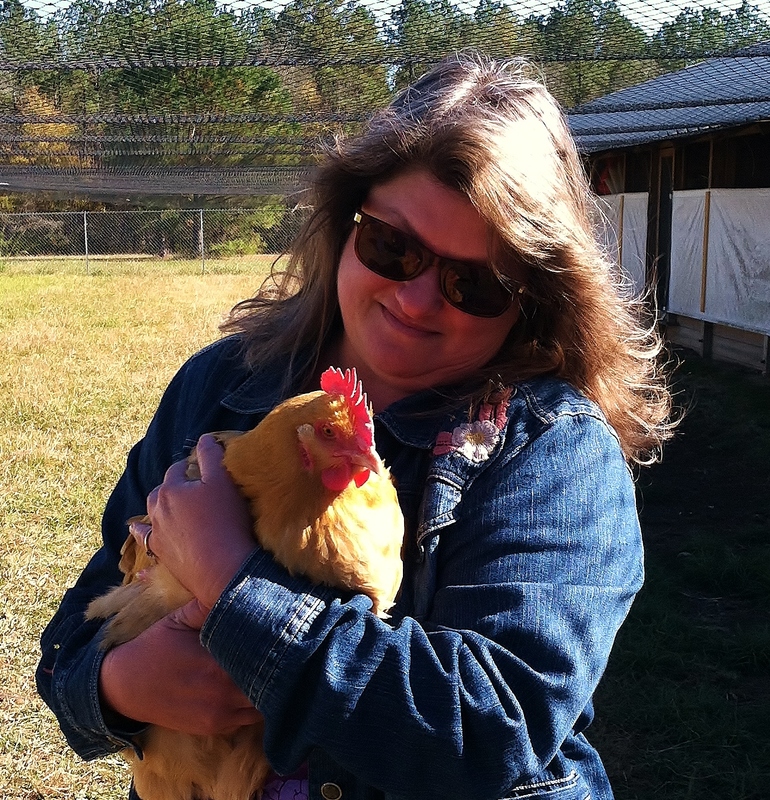 I asked for it back because we are donating the coop to the City of Ocean Springs, Mississippi in March, but more on that later. She kindly agreed to let me be an Indian Giver (can you still say that? ), so we rented a big honkin’ truck and went to get it. I plan to decorate it and use it as a fun Christmas scene in my back yard. Of course I’ll photograph this project and share the chicken joy with my readers. 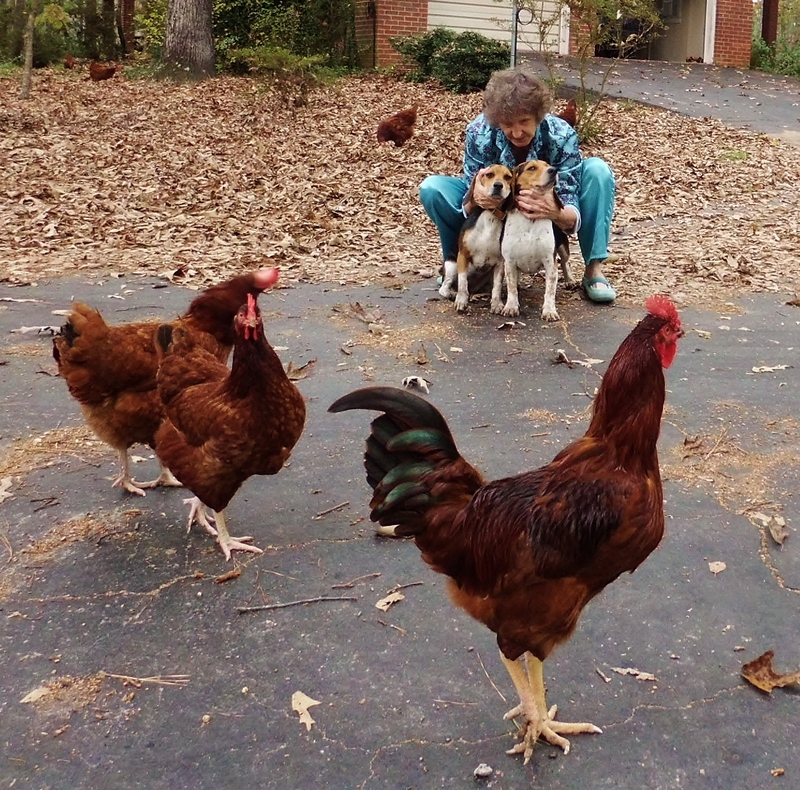 In addition to retrieving our chicken abode, we were able to visit our former pets, Rosy, Daisy & Violet. Debbie warned me not to be too upset that the girls aren’t as “people friendly” as they used to be. I guess when you live with chickens so long you forget how to act like a person. I was undaunted and armed with grapes and optimism. I called to the ladies when I entered their enclosure and it took a while for any chickens to show their fluffy selves. After calling another minute, my little alpha chick, Violet ran out and asked for a grape. She looked at me quizzically and then decided that she would jump for her old mom. Soon Daisy and Rosy waddled out and all three did the “jump for grapes” trick. Jim got a great picture of Rosy gettin’ some air. I tried catching one of them, but they weren’t in the mood. Of course Daisy has always been a pushover for Jim, so he was able to grab her and hand her to me for some serious chicken love. Before we left Debbie’s place we walked up to her house where Miss Scarlett and her buddy Carlos reside. 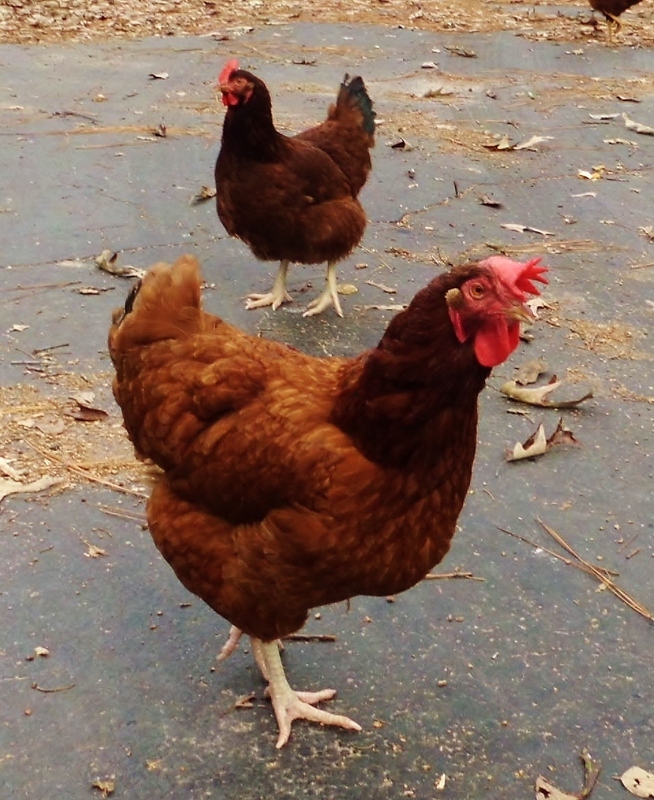 These two are “house chickens” and they prefer to live near Debbie and her family in a cozy little coop. They sleep there at night safe from predators, but during the day, they have free reign of Debbie’s yard and porch. They have learned to hang out with Buffy the gentle dog so that hawks and other predators don’t try to make chicken nuggets out of them. Debbie was able to pick up Miss Scarlett for a photo-op. 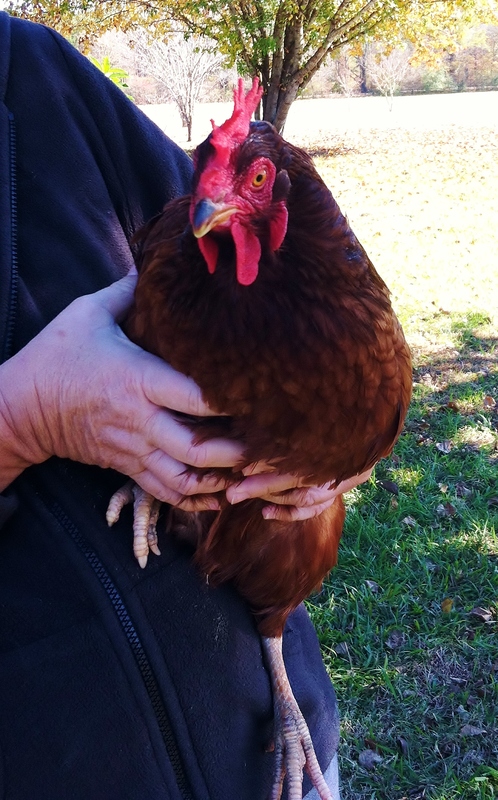 Scarlett was my orphan chicken and only lived with us until she was coop age, but in that short time, she learned that it’s pretty fun to live around humans. Debbie loves having these two nearby. I agree. Everyone should be able to look out their window at some pretty chickens whenever they want. Maybe one day I can do this again. Until then, I’ll have to be content with visiting my friend’s chicken paradise. Many of you are aware that I recently made a trip home for a family emergency. I’m happy to report that all is well on that front (and getting better every day). Usually I have leisure time to take pictures of the homestead and the assortment of non-human residents at my parents’ casa in Mississippi. Alas, I only had time to snap three photos on my way out of town. I thought I’d share them with you since I haven’t included any CHICKENS in the kittybunnychicken in a long while. Meet Floppy, my parents’ “pet” chicken with the overgrown goofy-lookin’ comb. I put “pet” in quotes because none of Mamma & Daddy’s chickens are really pets in the sense that my former chickens were. But since Floppy gets extra attention because she’s weird-looking, she’s figured out that being friendly can be advantageous to a chicken in terms of getting extra treats. Floppy has learned that if she flies up to the ledge of the picture window in the dining room, she can usually get a human to meet her at the back door with a piece of stale bread or left-over pizza. I tried to get her picture in the window, but every time I aimed the camera at her she jumped down. Floppy HATES the Paparazzi! I kept trying to catch her and hold her, but she was elusive. I did, however, train her in a matter of five minutes to let me pet her between bites, and to jump, a’ la Daisy, for her treats. Whoever coined the term “Bird Brained” was definitely NOT talking about chickens. These guys are geniuses when it comes to chow! 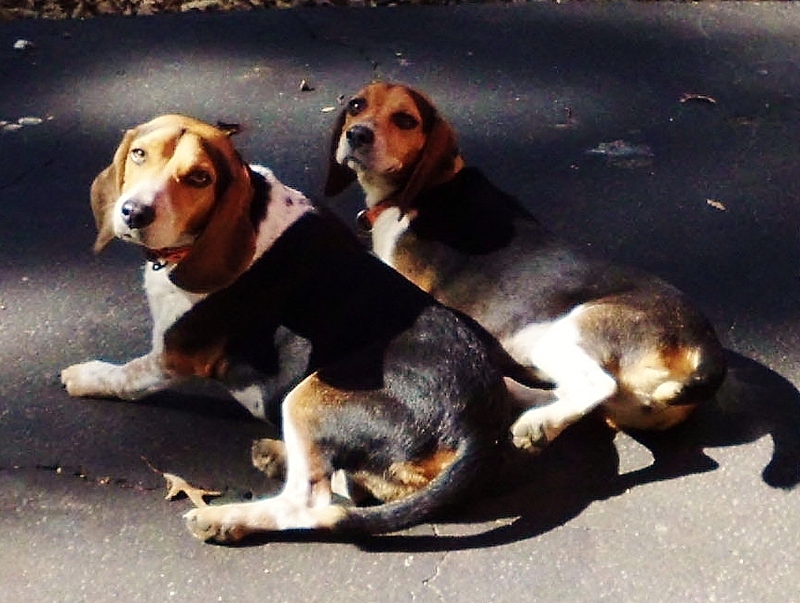 By far the most beloved pets on the Dobbs’ Farm are Snoopy & Lucy, the spoiled-rotten beagles and the apple of Peg’s eye. These pups live the good life for sure. Mom has a “bedroom” for them off the garage with a doggie door and a mattress with blankets. At night they actually go lie down and Mom comes in to read them a bedtime story and cover them with an old quilt. OK, I made up the part about the bedtime story, but she really does cover them, and they stay that way all night until they get up early in the morning for their daily hunting party. Peggy has always been a persnickity housekeeper and would never let any of our pets live inside when we were kids. Now these ladies have the run of the house and enjoy naps on her leather sofa. On second thought, I do remember Grunt, my pet pig, watching Gilligan’s Island with me after school on occasion.